The German could still play in the Europa League final, should Liverpool get past Villarreal. Emre Can may not play for Liverpool again this season. EMRE CAN COULD be set to miss the rest of Liverpool’s season after rupturing ankle ligaments in the Europa League quarter-final victory over Borussia Dortmund. The German looks certain to miss both legs of the semi-final against Spanish side Villarreal, with the first leg due to take place on 28 April with the Anfield return to follow seven days later. Should Jurgen Klopp’s side reach the final in Basel, it will be a race against time for the midfielder to be fit for the showpiece on 18 May. 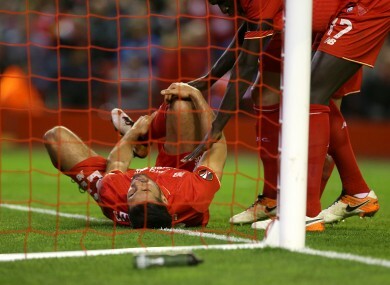 The Liverpool manager said: “Emre is injured. He will take time. The 22-year-old will be cautious about returning too early with the former Bayer Leverkusen player expected to be named in Germany’s 23-man squad for Euro 2016. Quiz: How well do you know the World Snooker Championships? Email “Blow for Liverpool as Emre Can set to miss up to 6 weeks”. Feedback on “Blow for Liverpool as Emre Can set to miss up to 6 weeks”.